Halloween is a fun holiday, especially enjoyed by children. However, Halloween fancy dress costumes can be expensive. There’s no point blowing a huge budget on one evening that is just a bit of fun for most people. It’s possible to come up with some really inventive Halloween costume ideas even when you’re on a budget. 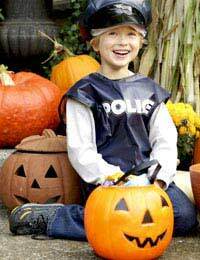 Most of these Halloween fancy dress costume ideas are low or no budget – they can be put together from things you have around the home or can buy very cheaply. Ghost: What could be more low budget than a ghost costume? Most people have a white sheet lying around. Cut the bottom into a zig-zag pattern and cut some eye holes. Voila! A cat – Add ears on a headband, a tail and some face paints. A bee – add deely boppers, face paints and make sure the T-shirt is yellow. A rabbit – add ears on a headband and a home-made pom-pom tail. A spider - Add legs made from black tights, stuffed with cloth or similar to make up the eight legs! Sew or staple the ends and pin onto clothing. Tin foil: Tin foil is your friend when it comes to low-budget Halloween fancy dress costume ideas. The tin man from The Wizard of Oz is a popular choice. You could also make a robot costume, using various sized boxes to construct the body. Bin liners: Bin liners are great for Halloween fancy dress costumes as they make ideal capes for witches and vampires. For the witch costume, just add a black outfit from clothes your child already has and some green face paint. You should only really need to buy a hat. Little vampires just need a white shirt and face paints. Fake fangy teeth usually go down well too though. Mummy: All you need to make a mummy Halloween fancy dress costume is bandages or white fabric and the patience of you and your child. Add fake blood for effect! Renting and buying: If you have quite an elaborate costume in mind, or are doing Halloween fancy dress for a special party, it might cost less to rent or buy the costume than to assemble it from scratch. Renting is usually cheaper, although you can buy simple costumes on a low budget. Pumpkins are very cheap in autumn and add a Halloween atmosphere straight away. Most pound shops have items such as fake spiders’ webs around this time of year. They will be a high-impact, low budget addition to any Halloween party decorations. Download free Halloween party invitations online to post or email to guests. Make ghoulish Halloween party food. For example, make a punch and call it witch’s brew. Add green food colouring to fruit juice. Adults may prefer something a bit stronger in it as well. Hard boiled eggs sliced in half also make great, if unappetising, eyes! To decorate your pumpkin, you'll have scraped out most of the flesh in order to put your candle or tea light inside. Set aside the flesh and make a delicious pumpkin soup. This will cut down on waste and save you money. Try serving the soup at your children's halloween party with some crusty rolls that they've made with you the day before - warm them in the oven before serving - delicious! To make your pumpkin soup, peel and chop a couple of onions and soften in oil or butter. Add the pumpkin pieces, the smaller you cut them, the faster they will cook, helping you save gas or electricity. Add about half a pint of liquid stock (home made or bought) - vegetable stock or chicken both work well. Bring to the boil and then gently simmer until all the vegetables are soft enough to blend with a hand blender (or mash by hand). Add nutmeg, pepper or paprika according to your taste, some people swear by a small teaspoon of curry powder too.